Price Paid: Bought it a year ago at REI with my annual dividend. I have used this tent for about a year in all four seasons and it's a very good lightweight option for most people under 6'. I like that the majority of the tent body is mesh, making for great ventilation in the summer w/o the rainfly and also great for stargazing. Overall I would recommend this tent to anyone wanting a lightweight 3-season option. I've had this tent for a little over a year and while I usually prefer to use a hammock, I have used this on four separate trips when the weather (rain) or terrain (above the treeline) require it. It is a great lightweight option but not for anyone over 6' tall or wide in the shoulders. I'm 5 1/2 feet tall and it has plenty of room for both me and my pack and has a very good sized vestibule but for anyone of a larger stature, it may feel more like a nylon coffin. On a 3-day trip to Sequoia, the tent worked extremely well. 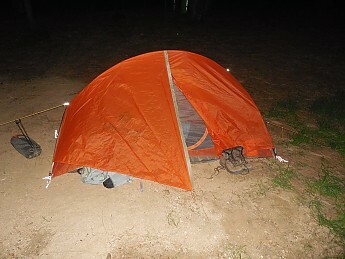 The nights were warm in August and with the tent body being 90% mesh, it was very comfortable without the rainfly. There is ample storage in the gear pocket at the head of the tent, but it would be nice if there were at least a gear loop on the ridge to hang a small lantern or headlamp. I would definitely not recommend trying to stretch this tent for four seasons. The rainfly does not quite reach the ground on three sides and on a winter trip to Mt. Whitney, we were in a blowing snowstorm and the snow would just blow right under the rainfly and pack up against the tent mesh. The tent sets up very easily and take down is a breeze. I would recommend this tent to anyone looking for a 1-person lightweight option. Welcome to Trailspace, John. Thanks for the review. Welcome to Trailspace, John! Thanks for sharing your first review with us. I'd love to see some pictures of your tent in your review, if you're willing to add them. Hi John. You can't add pictures to comments. However, you should be able to add a picture to your review: While editing the body of your review, click on the green tree icon in the editing menu bar to upload/choose and insert an image. If that doesn't work, send me a PM and I'll get you set up. Got it Alicia. Pictures are added. Thanks! Great! Thanks for adding those, John. That second picture looks like a nice campsite. Care to share where it was? This tent is lightweight, waterproof, relatively dustproof, and has just enough space to stuff your pack under the fly. This tent is really easy to set up. I toss down a cheap tarp as my groundcloth, unroll the tent and stake out a couple of corners, and then just clip on the main frame. If you're not immediately putting on the fly the setup is less than 2 minutes till it's securely staked. The netting is really nice and keeps out all of the bugs and lets you appreciate a good breeze. The fly can be partially clipped on, and if in the night it gets colder or starts to rain you can reach outside of the tent and yank the fly over with hardly any effort. Some nights it started out drizzling and I've done the opposite and didn't even have to fully leave the tent to flip it off. The fly is easy on and easy off, but it will stay on once you clip all the clips in place and stake out the zippered entrance. If it's really windy it helps to guy out the other side, but it's usually not necessary. My only wishes for the fly would be that the vestibule/door were just a few inches larger, and that the width ends of the tent fly were longer. I've never had any issues with rain blowing in even on windy nights, but it would help a lot with warmth. But conversely, it helps the tent breathe, so I like that. I've owned this tent for almost 3 years now and it's still one of the lighter tents on the market for a not insane price. It packs down well, and even without always using a tarp or groundcloth, the tent floor has no rips or tears, and remains totally waterproof. It has gone through hot weather camping in deserts, river camping (great for keeping out bugs), autumn camping, and monsoon camping in New Mexico. I work and play outdoors frequently and my tent is used at least a month or a month and a half a year cumulatively. When this one wears out, I'll probably buy another of the same model because of my experience with this one. The EOS 1P is a very light, simple, solo tent with minimal features but quality construction. It was adequate for my skinny 5ft. 10in. frame but it would be tight for larger people. Cramped for above average sized people. I have made a practice of using the lightest gear I can find that is also well made and suitable for what I'm doing. This tent carries the day in lightness and quick setup. 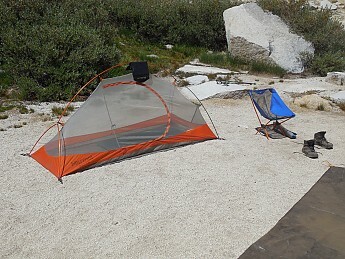 It provided good rain protection during the brief episodes of rain and snow I encountered the last three days at 12,000 ft. on the shore of Dade Lake above Rock Creek in the High Sierra. However with my 3-inch thick mattress system my head had only a small space in the ceiling to park without rubbing when I sat up. The tent is also narrow. In the vestibule there is room for your pack and boots so the cramped interior is not such a problem unless you are a hefty person. The bathtub floor section is minimal in that the floor material only comes up the sides about 3 inches….not much compared to some solo tents. But this saves weight as does the absence of pockets or loft storage. 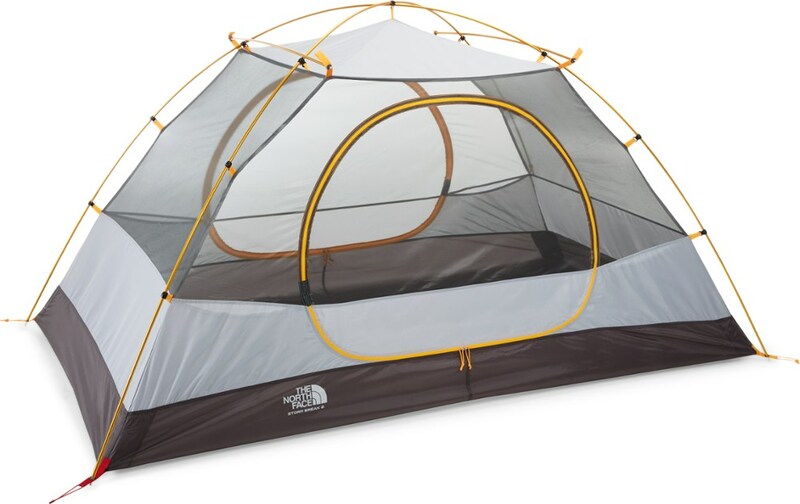 I think this would be a great tent for the PCT and other trips where weight is a concern. It is basically a mosquito net tent with a rainfly that sheds the wind and rain. Steven, I noted on your profile that you've been "lurking" for 6 years. Thanks for the first review! Thanks for sharing your Marmot tent review, Steven. I bought a new EOS1P in anticipation of an upcoming motorcycle camping trip. I wanted lightweight, ease of set up, durability and more than 15 sq.ft. of interior space. It has a claimed 23 sq.ft. I read other reviews and figured I could live with the narrow ceiling. It is light with an easy set-up. Colorful too. What a disappointment though as an actual weatherproof shelter. The tent fly on the head and foot ends just lie on the tent body. No guy out tabs are sewn into the hem AND the fly is short by about an inch on one end, it doesn't even cover the mesh above the solid portion of the body. No amount of tweaking or guying out, where tabs are available, changes a thing. 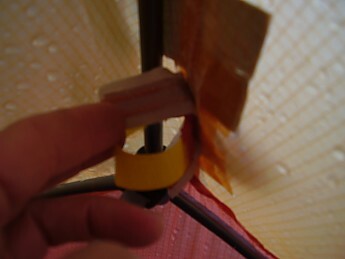 The fly offers no protection against the rain on the ends of the tent. Condensation will likely be a problem, too. How could such a stupid design get through Marmot's front door??? Well this one goes back. I should have known better than to buy another Marmot tent. I have their Hardshell tent. Great body design but on this tent too, an absolutely terrible fly that is never taut. It just sags on the body of the tent. You would think I'd a learnt right the foist time, eh? Thanks for nothing Marmot, stinking time waster. I'm quit with anything you sell. I bought a previous version of this tent. The new one is for people shorter than 6ft. If you ever plan to deal with the customer service, do not buy Marmot Tents. I sent them mine about 6 months ago (my tent has a lifetime warranty). After 5 years and about 5 2-3 day hikes per year the seam tapes started to go off. After 2 months I called them to find out that they received the tent and would replace it. I wasn’t happy, since they no longer produced a single person tent for a 6ft tall person, but said OK. 2 months later I called and was told that my tent had mildew and would not be repaired or replaced. They offered me to buy a net tent at a discount. The cheapest I could find would have cost me over a $100. I said NO, I want my old tent back. They said they would ship it. 2 months later – no tent. I called them and the guy named Fry told me they still have my old tent in their office. By the way, I dried my tent after every backpack and didn’t see any mildew when I sent it. I am a devoted devoted bivy user. Simple and lightweight. I am a devoted devoted bivy user. Simple and lightweight. This year I went to Philmont with my son's Scout Troop. They require you to sleep in a tent. Okay fine. I did some research and decided on the Marmot EOS 1P. I am a convert! Extremely easy to put and take down, lightweight at around 2.5 pounds, this is a keeper! Hubbed poles, micro mesh, storage pockets at the head, I loved it. The only draw back that I can see is the miniature holes for the stakes on the tabs and the fact that I can not sit up in it easily. I don't like the sippy straw weak stakes that come with most tents and always upgrade to the "Y" stake. These are difficult to extract from the tent on take down, but an inconvenience I am willing to put up with. We had a wind, rain and hail storm of biblical proportions one evening. All the others received some water or sagged greatly. My tent not only stood the test, (bone dry and sturdy), I slept like a baby and others were drying out! By morning my tent was completely dry and I can take it down and stow it in record time! The easiest yet for me of legendary pickiness as to how to pack my tent. I would recommend this for anyone of average height and build. After wearing out my trusted, never-once-let-me-down Mountain Hardware Solitude, and many wet, uncomfortable nights spent inside my very packable, lightweight, and intelligently designed but all-too-single-wall Mountain Hardware Waypoint 1, I needed a tent that could handle the climate and conditions of the Northeast. I live in New York state and backpack and camp primarily in the Catskills and Adirondacks. And yeah, I know, single walls don’t belong in humid climates. They’re made for the drier air and altitude of the West and Southwest. But the Waypoint 1 was a cool tent and I had to at least try. I even I took it to New Mexico for two weeks of Philmont trekking, thinking things would be better there than in New York. No such luck. I still woke up in the middle of every night and at the crack of every dawn just as soaked. When I got back—-and dried everything out—-I began looking through every outdoor store website, catalog and showroom I could find. After a couple of weeks of searching, a new REI catalog arrived in the mail and there it was. The Marmot EOS 1P. One look and I knew it was to be. But at the time none of the local outdoor stores carried it. And it wasn’t even on the Marmot website yet. 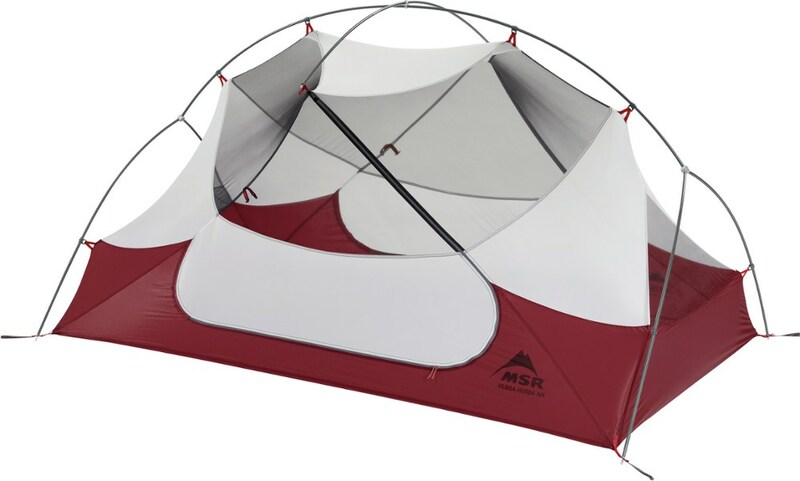 But the REI site had it, and I needed a tent for an upcoming weekend trek and ordered it sight unseen. Now, after carrying it around in my pack, and sleeping in it for a year’s worth of New York summer, fall, winter and spring, I’m both glad (and relieved) to report that the EOS 1P does not disappoint. It has turned out to be everything I hoped it would be—-compact, extremely lightweight (2 lbs. and change), lightning-quick to set up and strike, tough, weather proof and very well made. As for interior room, however, I would have to agree with other EOS 1P reviewers that a couple more inches at the head and foot would be nice. I’m 5’10” and I and my summer and winter sleeping bags fit in the tent comfortably. And I can sit up inside with the top of my head not brushing uncomfortably up against peak. But if I were over six feet tall, I might not think so. The incredibly simple hub pole system is similar to the MSR Hubba and the stakes are amazingly strong and light. The tent itself has a metric ton’s worth of mesh for ventilation (to keep you nice and dry), and the bathtub floor extends upwards enough to keep rain and snow from blowing up under the rainfly and into the interior. 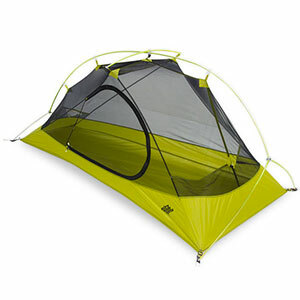 The fly itself has a nice self-sealing door zipper, an adjustable air vent and a large (for a one-person tent) teardrop window just over the door and bright reflective tabs for easy location after dark. The fly also extends out from the side-entrance door to create a decent-size vestibule for boots and smaller items. It’s not big enough to contain a full pack, but the space is ample just the same. There are a couple of interior pockets that are good for small stuff like socks and gloves. My only “druthers’” might be a softer color. 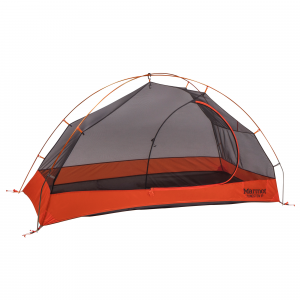 Marmot’s pumpkin-and-terra-cotta color scheme illuminates the inside of the tent like Klieg light when the sun hits it. But on the other hand, it does get you up and at ‘em every morning in no time flat. So. If you’re in the market for a dependable, well-designed one-person tent for weekend hiking as well as long-haul treks—-and you’re under six feet tall-—take a good look at the EOS 1P. It’s the real deal. And great value all around. As for that Waypoint 1, I gave it gladly to my brother-in-law, who has since used it for bike trekking/camping in Colorado at 6,000 feet, and while camping in Mexico. No problemo. He loves it. Poor rain fly construction. Doesn't hold up to light usage. Not enough room in the vestibule to keep pack out of the weather. All three Velcro points were glued in, not sewn and sealed. Every one came loose and the tent leaked. The entire ridge line lost its seam tape, though, when I pitched it a week before, it was fine. The tent was used twice in nine years. Stored dry and proper the entire time. Unfortunately I experienced the same thing with a tent from a different company. There's just something about long term storage that can take its toll on a tent. Have you contacted Marmot to see if they will repair the fly under warranty? I've been very satisfied with the Marmot products I've owned, so it's disappointing to hear about your bad experience. I agree about contacting Marmot to see if they'll help resolve your rainfly issues. Let us know how it goes, please! Also, if you have any pictures of the tent/rainfly, those could be helpful for others to see in your review. Good luck! Thanks for the picture, Nick. This is a really nice 1-person freestanding tent, with all the trade-offs that that encompasses. I bought the 2009 EOS 1P after realizing that my 4.5lb 10-year-old 2-person tent was really no longer cutting it: I wasn't doing 2 person hikes anymore and it wasn't really keeping out the weather. Hoping for something bigger than a bivy but lighter than that, the EOS1P seemed like a good compromise. Compromise is the right word. It's not very tall (I'm 5'6" and it's a bit snug around my head when I sit up). It's very narrow (I can barely fit in something next to my sleeping pad). But it weighs less than 3 pounds and it really is freestanding (you'll want to stake out the fly but you can fudge that). And it's way more comfortable than my bivy sack. It's ridiculously easy to set up, with just 1 pole. The side entrance is easy to get in and out of. I have used the EOS 1P on several weekenders and 1 weeklong trip. While I abstractly wish that it was a little bigger, realistically this has been a great tent and "a little bit bigger" means "a lot heavier." Count me as very happy. Great tent. I was hesitant about how much room I would have being taller than 6 feet. And then I bought the EOS 1person tent because the review video on youtube was great and was at the packed size and weight I was looking for. It's for sleeping in, not inviting guests in to play cards. The vestibule is big enough to keep your pack, shoes and odds and ends dry. I love the single pole construction, which makes it simple and a freestanding tent. The door is big and the sides go up enough to keep any water out. I also like the signature Stake Tape. 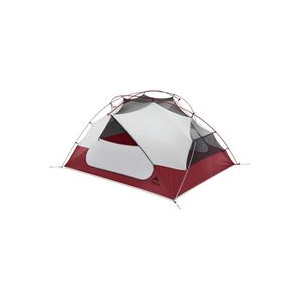 I purchased this tent from REI with the foot print $224 with 20% off. I have used it for everything from bicycle touring to ultra-light back packing and mountaineering. It is easy to set up and take down. It offers the use of just a mosquito shelter in hot regions. You can use just the fly and the foot print to make the lightest possible shelter at just over a pound. Great product as always from Marmot. What else would you expect? A great tent for light weight three + season camping. I purchased this tent to use while backpacking here in Arizona during the spring and summer. I was drawn to this tent because of the size and for the fact that it only weighs 3lbs 3oz. Set up of this tent is very easy color coded poles make set up a breeze. I have just returned from a trip which put this tent to a pretty decent test. The first night of my trip at 5,616 ft I experienced winds around 40mph and temperatures dropped down to 25 degrees. The wind was not a problem at all, this tent DID NOT BUDGE. For the remainder of my trip I was camped along a river at 2,639ft. I had this tent staked down in very loose fine sand and experienced similar temperatures and winds around 25mph. Once again I had no problem at all with the windy conditions. In the mornings I didn't notice any condensation inside the tent and I was warm and dry. The tent has very good ventilation and I felt comfortable inside although I am only 5'10" 160lbs. Sitting up and changing clothes wasn't a problem, but for someone larger this could be an issue. The vestibule area had plenty of room for my pack and boots. 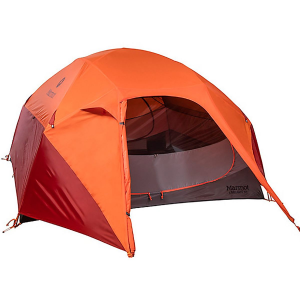 Overall I believe this tent is great for someone looking for a very light, simple tent that is great for week long or weekend adventures. Ease of Setup: Extremely easy to set up! This tent has served me well. Being small and short, I have found that this is a great little, light-weight tent; one of the easiest ever to assemble. The spoke pole system is fantastic. The fly provides enough space for my pack and boots. The screening allows for great ventilation without moisture accumulation inside the tent. Stayed dry in the rain. I would compare this tent to the Hubba...only difference is a little more headroom in the Hubba. Wouldn't want any other! Finely constructed tent with enough floorspace for one. Easy to pitch, but not enough guy out points to keep the fly from flapping in the wind. Nice entry with an ample vestibule. My big complaint is with the narrowness of the top of the tent. It may have a tall peak height, but you can't sit up without the mesh squeezing your head. I've had several one-man tents, and none of them are like this. I backpacked for the first time last August. 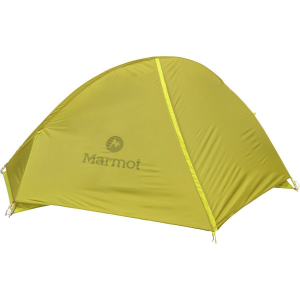 Knowing nothing about backpacking tents, I bought the Marmot EOS because I liked the colors of the tent, the freestanding design, and the light weight. It was very easy to set up. Only complaint is that I cannot sit up in the tent without my head rubbing against the tent ceiling. It rained all night the first time I used the tent and not one drop came in. I especially liked the fact that the nylon tent material meets the mesh halfway up the sides of the tent to prevent the rain blowing in under the fly from getting me wet. The bright colored fly also helped me find my tent after a nature call. I am pleased with my purchase. I bought this tent because I decided I just can’t deal with a full fledged biv sack. This tent bridges the gap of a lightweight shelter I can sit up, turn and read easily in perfectly for me. Quality of this tent is outstanding and of course it is super lightweight. That and it has a large vestibule to keep your stuff dry. I can’t imaging an actual tent getting to be much less weight then the EOS1 is now. My only gripe is that the interior dimensions stated by Marmot seem to be a bit off. I am 6’1 and my head and feet just barley touch the bottom and top of this tent when I lay in it. I laid down in it in the store and almost didn’t buy it because of this. In the end I did buy it. I have not been in a storm with it yet so I can't give you a good idea how it will perform. It's Marmot though so I expect only the best. It does gather condensation with the lid on. SO much so on a cold morning you’ll be wide awake by the time you leave the tent. All and all, especially for the price this tent rules. I paid $176 for this tent after a 20% discount from the $220 retail price at REI. The footprint wasn't cheap at $35. This single-person tent is the best I have ever owned, and that includes multi-person tents as well. I've used it now when it was hot, cold, raining and humid... and it doesn't even THINK about condensing inside! Best of all, this tent is really light. It has a single pole design that snaps together and it takes me about 2 casual minutes to set it up. This tent is really well thought out. There are snaps on the rainfly (if you choose to use the rainfly) that attach to the footprint. And if it's really hot, you can use the footprint with only the rainfly which is a really nice option (if there aren't a lot of bugs around). The top portion of the tent is netting, so if you are not using the rainfly, you can watch the stars. This tent has pleased me so much that I've had difficulty finding anything to critique. But minor troubles include: the manual says the grommets are color coded to help with setup... I couldn't find any color on mine, but setup was easy anyway. And the storage net/pouch inside the tent by my head is pretty useless. Pretty minor stuff for such a great tent. The only consideration that I definitely note: I'm 5'9" and I WOULDN'T want to be much taller if I used this tent. Overall, A+++. The Marmot EOS 1P is not available from the stores we monitor. It was last seen April 14, 2019	at Backcountry.com.